While going through all of my old school stuff from the UofC and uploading it into gmail, I came across the poster project I did for an immuno class at the end of my third (I think) year. 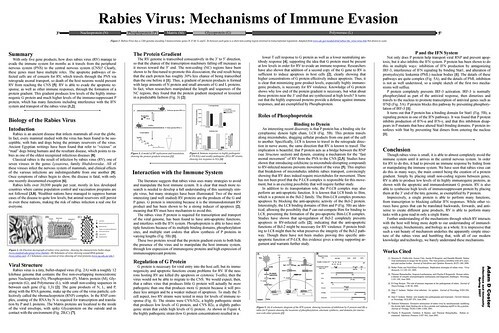 It’s saved as a jpeg, so I put it up on flickr for anyone who’s interested in learning how rabies works. It’s pretty impressive how much it can do with so little genome. Anyway, click the image below to learn about rabies!